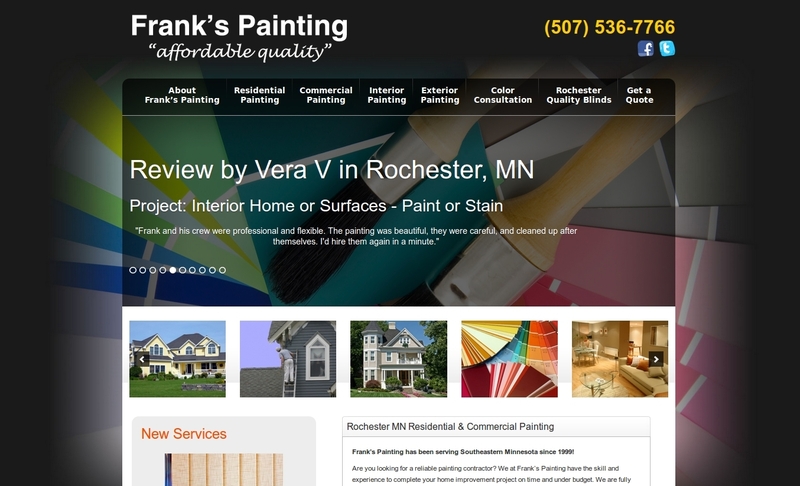 Frank’s Painting has been a leader in the Rochester, MN area since 1999. Frank and his crew specialize in all types of painting. Whether it be Residential, Commercial, Interior or Exterior, Frank can do it all. He and his crew are one of the top rated painting companies in the Rochester area. They are there to help you with all of your painting and staining needs. The ‘new’ site looks almost exactly like the old site. Frank was looking for something to help give him more of an edge in the search results. After a few discussions, the main thing that we could do was to give him a mobile friendly site. Frank’s new site took the existing design and folded in the responsive Bootstrap framework. In addition, the old site was a static site with HTML files for each page. Opie’s Computers took the design, once mobile, and created a custom WordPress theme. The site is not much more user friendly and has the ability to change more easily to adapt to changing SEO needs in the future. Plus, Frank’s customers now don’t need to do the ‘pinch and zoom’ to view his site like they had to in the past. The site is currently hosted and domain registered with GoDaddy. We have used Opie’s Computers for out IT solutions for several years. I can’t imagine using anyone else at this point. He is the best. We have an automotive repair.